I was browsing Netflix Streaming last night looking for something entertaining, perhaps mindless to watch. I’ll interject here that I don’t typically watch Netflix movies during the week; my boyfriend and I had eaten an early dinner and were looking for something to watch on TV and there really wasn’t much on. Well, there were a few shows I’d have been okay with but the BF vehemently despises commercials and during prime time news, commercials seem more annoying than usual. I digress. So I’d not heard of Grabbers, nor did any of the cast members ring a bell. The title was really off-putting- it sounded like a total cheese-fest, however, since I was honestly considering Sharknado, silly movie titles obviously don’t scare me away. The synopsis for Grabbers states, “When alien monsters go on a murderous rampage on an Irish island, the only survivor is drunk ” because alcohol makes blood toxic to the aliens. Now, as a sober cop tries to stop the carnage, the rest of the town must get wasted in order to survive.- I wanted to participate in the film as much as I could, so I cracked open a 24-oz can of Natural Lite I bought at a gas station on the way home from work and the BF and I hit the play button. As the movie begins, I was impressed with the quality of the film. It wasn’t low-budget as I had initially thought. We first see a shot of the ocean and fisherman’s boat and then a fireball colliding into the water. The action begins almost immediately into the movie when viewer sees a quick shot of a tentacle erupting from the sea shortly after the fireball, grabbing hold of one of the men. The effects are obviously CGI but really well done. We’ll see more CGI later in the film. Enter our two main characters, Ciáran O’Shea, a slobby mediocre looking GARDA officer is picking up his temporary replacement partner, Lisa Nolan, a young, beautiful and no-nonsense officer from the Irish mainland. At first, the dueling cops concept is a bit off-putting; its been done thousands of times before in film and on TV. 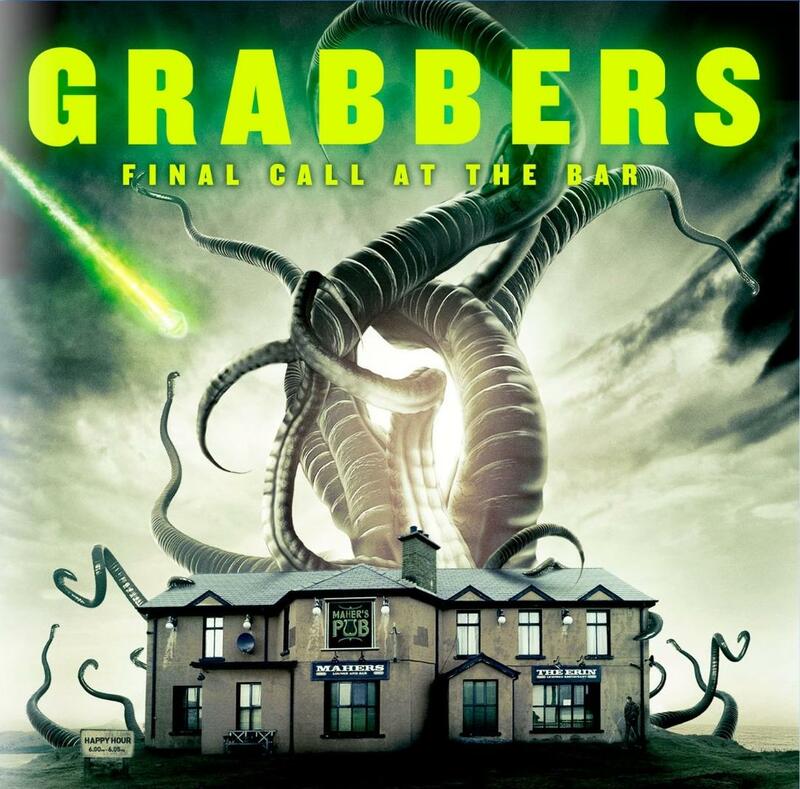 But I reminded myself that the name of this gem is Grabbers and the only way of combating the bad guys is by being drunk, so obviously this movie doesn’t take itself too seriously so decided not to either. After some back and forth banter in the cruiser, the pair gets a call that several killer whales have washed up on shore. Ciáran and Lisa meet up with a local medical examiner, Dr. Smith who is unable to determine the cause of the whales’ demise. While the whales have been obviously attacked gruesomely by some creature the the officers don’t seem altogether concerned at this point. So after the main cast of characters has been introduced, the scene cuts to an unknown couple. Bad news, they are probably doomed since we’ve never seen them before. The audience witnesses a satisfactory kill-scene which is shortly followed by another scene in which we get to know the village’s favorite hobo-looking drunk, Paddy, a bit more intimately. 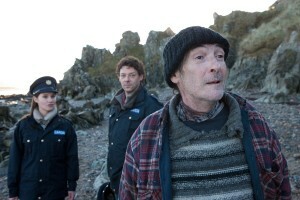 We also get to see more of the creature, which cannot get the upper hand in the drunken altercation with Paddy. The viewers also learn that Miss Alien is a mom, and has conveniently laid her slew of eggs on the beach. After taking an alien monster hostage, the motley crew perform a few novice experiments on the creature and soon determine that a substantial blood-alcohol level has magical defensive powers against the alien octopus. Oh no, though, because conveniently, beautiful Lisa admits that she’s never been drunk before! Apprehensively, Lisa agrees to throw back several pints, including some homemade moonshine that Paddy cooked up. 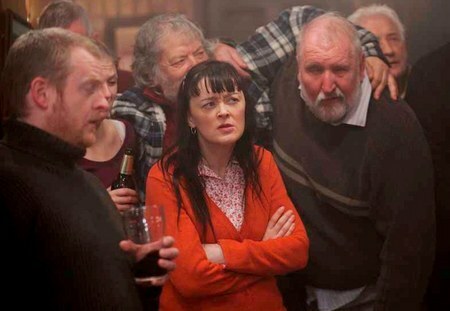 After she’s predictably sloshed (and giggly and still beautiful, perhaps even more attractive than before) Ciáran and Lisa invite the entire village to a local pub for free drinks in an effort to safeguard the townsfolk from the monster alien. The pub gets comically drunk, the crew gets expectedly the upper hand, and overcomes the big momma alien with a flare gun plus the remainder of Paddy’s homemade brew. The alien’s babies, who have mostly hatched, are also easily dispatched. We cut to Ciáran and Lisa engaging in their celebratory buzzed-make out session (did I mention that none of the main characters ever had to pee?). The end. Or is it? Cut to an unhatched alien egg on the beach. I was generally amused and unexpectedly enjoyed Grabbers. It was comically predictable but fun and well-executed. My main criticism was the actors’ heavy Irish accents. To be fair, the audience didn’t really need to understand all of the dialogue for the movie to work so it wasn’t too much of a detriment and was only mildy distracting.